With war about to be declared in 1939, TV screens went blank after a Mickey Mouse cartoon. When programmes resumed 60 years ago today, the UK was soon changed for ever. When BBC television resumed after a seven-year gap during World War II, it was as a monopoly with one channel to a tiny audience and an establishment that doubted it would ever catch on in a country dominated by radio. Newsreel footage of the opening ceremony - there is no recording of what was actually broadcast - shows announcer Jasmine Bligh emerge from a car at the steps of Alexandra Palace, in north London, and speak into the camera in cut-glass tones. "Good afternoon everybody. How are you? Do you remember me, Jasmine Bligh? Well here we are after a lapse of nearly seven years ready to start again and of course we are all terribly excited and thrilled." So began the second age of British television. The first had ended with the outbreak of war. 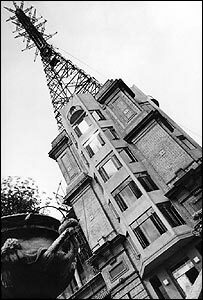 On 1 September 1939, the order was sent to the BBC's studios at Alexandra Palace that transmission should end. Russ J Graham, television historian and writer for the Transdiffusion website, says it was feared bombers could lock onto the signal. "We were expecting death to rain from the skies, and Ally Pally would have been the target for it. It was the strongest and clearest signal in Europe." But fellow historian Andrew Emmerson says it was also seen as an expensive luxury. There were no more than 20,000 televisions in the whole country, and reception could not be guaranteed more than 20 miles from Alexandra Palace. And the engineers were needed elsewhere - 50 left to work on radar-related projects. In popular mythology the signal was cut off half way through a Mickey Mouse cartoon, and resumed in 1946 at the same point in the cartoon with the announcer intoning: "As I was saying before I was so rudely interrupted." The reality is far more prosaic. At 12.35pm on 1 September 1939 - half an hour after it should have been switched off - television in England ended with the playing in full of Mickey's Gala Premiere followed by test signals. There was no announcement explaining why the service had been suspended. The programmes missed on that autumn day included A Visit to Regent's Park Zoo, Practical Household Suggestions by WP Matthew and Interest Film: West of Inverness. But the powers-that-be did decide that the new era of British television should start with a repeat. After a ceremony, the same Mickey Mouse cartoon was played followed by a performance from Mantovani, also postponed from 1939. The line about being interrupted was actually in the newspaper column Cassandra. There was no way to measure the audience that day, but there cannot have been many watching. "A potential audience [of thousands] before the war, but with bombing and with moving about it had vanished to almost nothing," says Mr Graham. In an address during the opening ceremony, the Earl of Listowel, the postmaster general, prophesied that the medium must become a recreation for the many: "They will gain from a nationwide television service fresh mental inspiration, and a more vivid awareness of the greatness of their country, as well as pleasure and relaxation after a long day's work." A far cry from the limited programming of 1936-39, says Mr Emmerson. "It was a very rarefied sort of entertainment and so highbrow it wasn't true. A lot of the ordinary people who bought sets must have been desperately disappointed." The highlights were variety shows, plays and tricky outside broadcasts (OBs) from sporting events, but what went in between could sometimes be a little underwhelming. "It was an awful lot of 'let's wheel the cameras outside Ally Pally and show a demonstration of golf swings for an hour and a half'," Mr Graham says. The feeling was that radio, with the millions tuning into the Light Programme and Home Service, was where it was at, and where it would stay. The pioneers of television often grew frustrated with their sceptical masters. 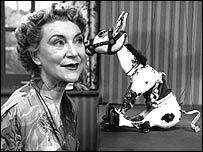 But the pattern of much modern television was soon set, with early successes such as TV comic Richard Hearne, TV gardener Fred Streeter, TV chef Philip Harben, and of course, Muffin the Mule. 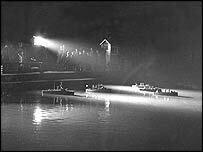 An OB from a display on the Thames was cancelled after rain damaged camera cables, and an early effort at a home improvement show failed due to the atmosphere of austerity. Chef Philip Harben, "a master of televised cookery"
"The proposed television version of How to Furnish a Flat has now fallen through owing to unavailability of the furniture," a committee noted. 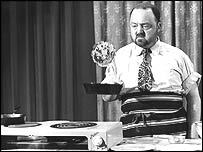 An experiment at TV hypnosis in 1946 failed after a closed circuit demo left four viewers asleep, with the BBC noting that "hypnotising viewers who might not have anyone at hand to wake them" would prove dangerous. To this day TV regulator Ofcom bans hypnosis that could affect viewers. But the arrival of ITV in 1955 really set the ball rolling, says Mr Graham. "The BBC was boring, the programmes were worthy. It took the coming of competition before the BBC got good. 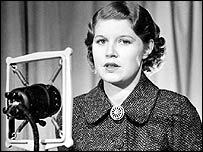 It was effectively a radio organisation." But the day after the ceremony, the BBC broadcast the victory parade from Pall Mall and won over a few doubters. Jonah Barrington, a newspaper columnist, was impressed with the advantages of rolling coverage of big events over newsreel and the way viewers could get up close to the personalities. "In time, no doubt, they'll impose a limit on how long a television camera may rubber-neck a famous personage, but in these early days it is free for all," he wrote. Soon transmitters were built in the Midlands and the North, and by 1953 a mass audience watched the Coronation. It wasn't predicted on 7 June 1946, nor was it written in the newspapers when the grandfather of television, John Logie Baird, died a week later, but a major cultural shift in Britain had already been mapped out. Fascinating to watch the restart of British TV, captured on film in 1946, via the internet and my web browser here in Texas in 2006. Can't help but wonder what people like me will be up to 60 years hence. Any ideas? I think Jonah Barrington was a tad optimistic when predicting a limit being placed on how long camera's would 'rubber-neck' at celebrities!. I distinctly remember we had the only TV in the street and all the other kids used to come round to watch Billy Bunter, I think the screen size was something like 12 inches happy days!! I can vividly remember in the early 1950s travelling 35 miles every Sunday to my grandfathers house to watch television. I seem to remember he paid £350 for the set. One hell of a lot of money then. The big excitement was the first showing of ITV in 1955. I can remember the first advertiment for Gibbs SR toothpaste. Television has come a long way since those days..! What was to have been a great way of educating, entertaining and inspiring the country has now become a gluttony of trashy programmes with no originality or inventiveness. Where are the great broadcasters and people we trust or would call role models? I don't have a television. I've weaned my self off TV and lead a much fuller life (i believe) without it. Now, in the evenings, I "go out and do something less boring instead". Good Riddance! Contemporary joke: Flying saucer over London, Martian Commander sees a sea of new-fangled 'H' TV aerials - "Cor, look at all them girrls!" I first saw TV when we packed into a neighbour's for the Coronation - well done it was too. But don't mock the 'cut glass' accents now - everyone had their own accent then, and proud of it. And when ITV came along, it wasn't even 'done' to have the ITV 'fishbone' aerial also on the chimney - patricians had only the proper, bigger, BBC 'H' style for all to see. I dread to imagine the consequences of a similar interruption, were it to happen again in today's compensation culture. Typical - stops broadcasting after a Mickey Mouse cartoon. Seven years later they resume with the same cartoon. The start of a trend - nothing but repeats on the BBC! Thank you for a timely and memorable account which took me back to my early youth. It is a pity it has become the medium for the transmission of so much real and fictional violence, tending to normalise such happenings. Against that the nature films, commentary on global warming and cultural programmes are invaluable. So 1946 and the first flush of "Air raid shelter" make-over programmes hits the screens. I remember a radio newsreader commenting on the stuffiness of the BBC Radio, saying he was required to wear a formal dinner jacket sitting at a microphone to read the news, he also said no rules required him to wear trousers! My parents were resonably comfortable after the war, as my father was an ex-RAF officer and an engineer, but, as far as I recall, we never aspired to TV until the Coronation. I can stil recall getting very excited as a child at some of the detective and space adventure programmes on radio. Not much change then! You say that Ofcom bans hypnosis on television but anyone watching Big Brother for more than five minutes is in danger of being driven into a deep coma.